Businesses have been developing mobile apps for hotels and short-term rentals in an effort to succeed in the ever-changing hospitality industry. Technology plays a large role in the hospitality industry thanks to its ability to improve the guest experience through added convenience and comfort. Image Source: Unsplash user rawpixel. A study from Statista and Deloitte discovered that travel and tourism are worth more than 10% of the global GDP, with the hotel industry alone is slated to grow by 6-7% in 2018. Plus, the High Tech for High Touch: 2016 Hospitality Vision Study found that 68% of hotel guests prefer to avoid the front desk by using their smartphones to check in to a reservation. These figures show that a well-designed mobile app can play an integral role in bolstering a hotel brand’s reputation and revenue. But what does should that app look like? Here are some of the key features that these hospitality apps need to succeed in today’s digital environment. The idea of a mobile key fob is simple—guests can use their smart device as their hotel room key, saving them the worry and hassle of carrying around (and fumbling for) plastic key cards. An additional struggle is that most modern hotel keys use magnetic strips, which can easily be deactivated when placed next to a smartphone or another electronic device, locking guests out of their rooms. A mobile key fob is a feature that an app developer can create in order to optimize a traveler’s hotel experience. One such app is SPG Keyless, developed by Starwood Hotels & Resorts, which allows travelers to check into their hotel, get their room number and unlock their door, all from their mobile device. The app requires guests to create an account and offers push notifications. 24 hours before their hotel stay, the app will send them a notification asking if they’d like to join the SPG Keyless program. After agreeing, guests provide their estimated time of arrival and receive a notification with their room number once it’s ready. The mobile key fob works the same way a hotel key works—all a guest has to do is open the app (with Bluetooth enabled) and hold their phone next to the lock. The door’s lock will then flash green and the guest’s phone will vibrate. The hotel operator designed the app so that more than one device can open a room, as long as it’s approved by the person who booked the reservation. Mobile key fobs are among the most important technological developments that any all-in-one mobile app for hotels should have. They streamline the process of getting the hotel key, checking in and accessing a room—especially helpful for busy times or late nights. And making such an app complementary will make your guests feel as if they’re getting extra value from their stay. Another popular feature in mobile apps for hotels is mobile concierge software, which improves the guest experience by giving them full access to everything the hotel has to offer in one place. Apps such as Lumio Mobile Concierge aid guests throughout their stay at participating hotels, helping them check in, ask about amenities, request room service and check out. Guests can keep their schedule organized with notifications that remind them about events they are taking part in at the hotel. Hospitality locales are set to benefit greatly from this type of app, as they can also offer customized marketing functionalities, rolling out advertising campaigns designed around the client’s behavior for increased revenue opportunities. A hospitality business can use machine learning technology to learn about an app user’s search habits and promote ads that they may be interested in, perhaps even with notifications. The app could also offer users optional questions to learn about their eating habits, preferred amenities and more, then recommending a specific meal, spa treatment or movie they may like. Hotelgenius is another app that offers similar capabilities, including a digital map of the hotel and nearby hotspots with navigation features. Guests can also text and chat with the front desk and receive an answer right away. The app is also multilingual, supporting guests from all around the world. The right app addresses all these problems, tailoring the guest experience to their liking and providing exemplary service. There are plenty of booking and payment apps for hotels out there with functionalities designed to keep guests happy. The Hotels.com app offers plenty of deals and promotions on hotel prices, while also offering loyalty and rewards programs for those who travel frequently. Intuitive booking system. These apps perform well when they have an intuitive booking system that clearly requests what city the guest will be traveling to, what nights they’ll be staying for and what type of room they’re looking for. The mobile booking process should be straightforward and painless, walking customers through their hotel and room options in as few steps as possible. Comprehensive yet simple payment. The payment gateway should be comprehensive and easy to use. Guests should have the option of paying with a variety of credit cards, through bank payments or alternate payment methods such as PayPal and Apple Pay. That way, they can complete the entire booking process from their phones. The right developer can help you customize your app in a way that fits your hospitality business needs, while also considering every facet of what a guest may need from you. A successful hotel or short-term rental experience consists of an easy check-in process, a stay where the guest’s every need is met and a quick check-out experience, so your guest’s last interaction with you is a positive one. If you’re seeking to develop a mobile app for hotels or short-term rentals, you will need a developer with the experience and technical expertise to help you do so. 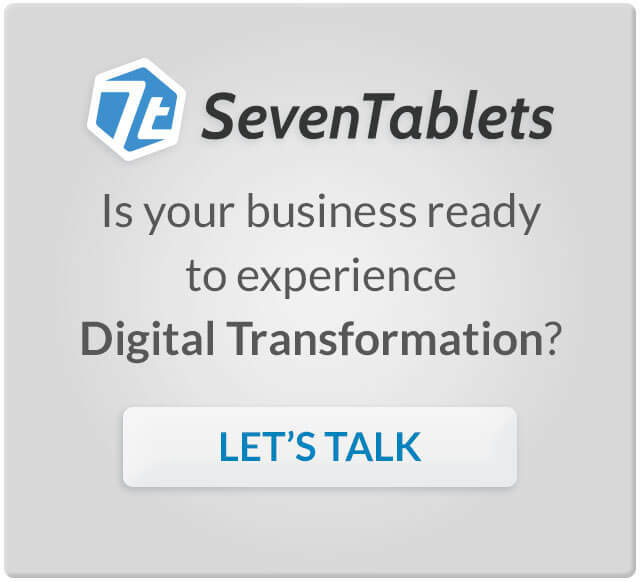 The team at SevenTablets specializes in app development with experience in the hospitality industry. We’re also well-versed in other emerging technologies, including augmented reality, virtual reality, artificial intelligence, blockchain and natural language processing.